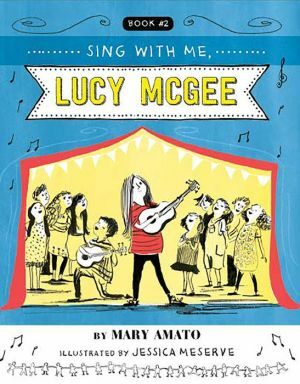 When a talent show brings out cutthroat tendencies in her classmates, aspiring singer, songwriter, and ukulele player Lucy has to fight for what's fair and avoid falling for mean girl Scarlett's ploys yet again in the second book in the generously illustrated Lucy McGee series. Feisty and gullible, Lucy McGee has a lot to learn, but she has a blast doing it in this fun-filled chapter book with over 100 illustrations. Lucy and Philip are fuming when they find out that Scarlet is trying to exclude them from the songwriting club's ukulele and singing act at the talent show. Soon Lucy is in the doghouse again after her plan to get back at Scarlet backfires. So, Lucy calls a truce, but Scarlet only pretends to stop her antics. She locks Lucy and her friends in a janitor's closet during the show. It's up to Lucy to help the club members escape yet keep her own integrity. Characters dance across the pages in this heavily illustrated book. Backmatter includes lyrics to songs written by the kids of the songwriting group and ukulele chords to encourage readers to play along and improvise.